When in Florida, seeing alligators is a must. I had no idea how huge the Everglades are. You’ll have to excuse me, I’ve lived in the Pacific Northwest my whole life and only visited Florida for a random day when I was 17 to go to DisneyWorld. So this visit to Fort Lauderdale we explored and found Sawgrass Recreation Park and their airboat ride to be perfect for our first encounter with wild alligators. Wow! Let me just say it again…WOW! From the moment we stepped down onto the dock until we got in the car to leave, we were impressed. Captain Disco, yes, that was his name, met us and took us to his airboat. But first, he showed us a little gator laying in the lily pads just off the dock. I giggled and felt a tiny surge of fear pop into my heart. Not knowing anything about alligators I wondered, “would they try and jump on the dock and bite my toes? Is this really a safe trip?” These fearful questions were put to rest quickly as our captain informed us we were fine as long as we stayed in the boat. Captain Disco was every bit a Florida Everglades captain as I ever dreamed of. A slight bayou accent, a laidback walk, and teaching through stories and experiences, Cap’n Disco kept us captivated while sharing his love for the area. Though extremely loud, an airboat is surprisingly smooth. At Sawgrass, every passenger gets a pair of earplugs that come in quite handy when the motor turns on. We chose the 30 minute airboat experience and it was just enough to see a couple large alligators sunning themselves in the water. 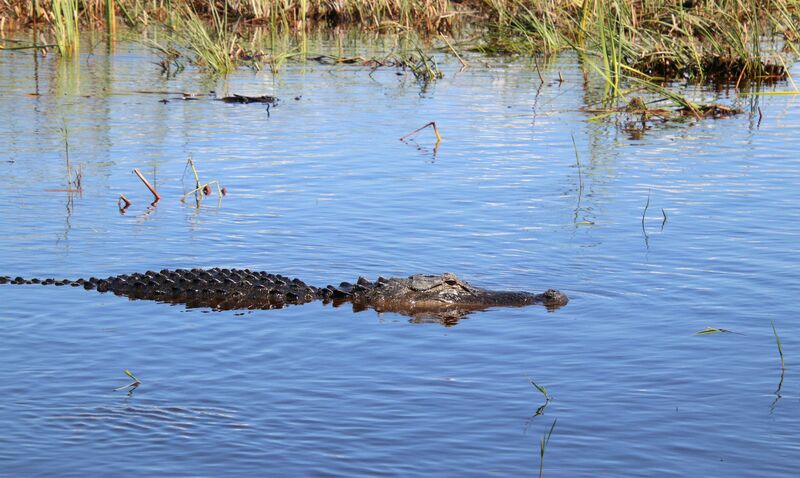 We learned that alligators are not a threat during the day, and hardly a threat at night. They rarely, if ever, attack as an alligator doesn’t like to exert energy. During the day, they swim around, warming up. All the spikes (or “scoots” as Cap’n Disco called them) along their backs work as heaters for the alligator. They are made up of triangular bones with holes throughout where blood warms before circulating through the body. Disco even passed around a “scoot” for us to examine ourselves. 30 minutes passed quickly, but we still were able to see a 7 and 8 foot alligator just floating around in the wild. They each very peacefully swam up to the boat and graciously allowed us to take their pictures. They aren’t hungry during the day. Alligators are surprisingly lazy. They only want to eat what easily fits into their mouth. So a human is not at all appetizing. As our boat returned to the dock, the warm Florida breeze gave us a welcomed reprieve from the heat of the day. 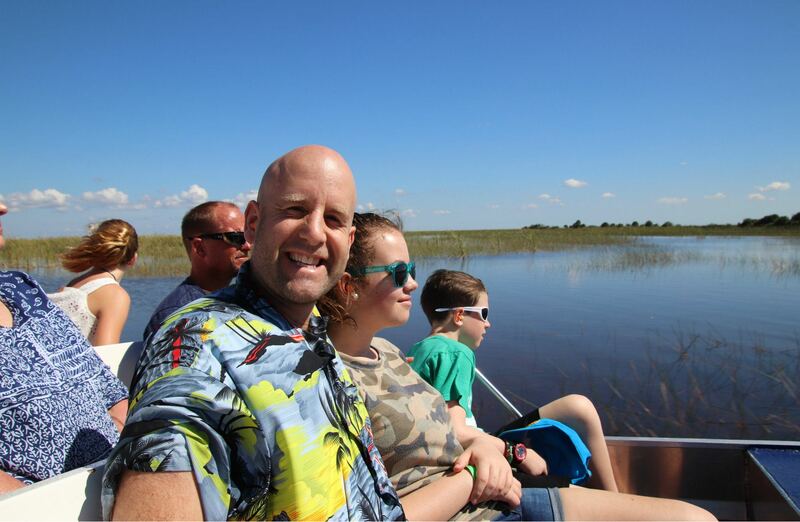 Our half-hour airboat ride was only a small part of our experience that day. 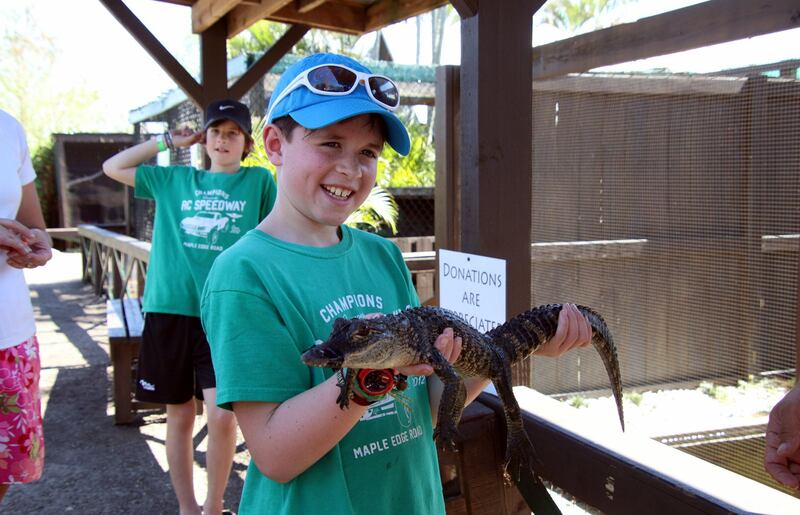 Sawgrass Recreation Park is also a refuge centre for many exotic animals. Big cats, monkeys, snakes and more born into captivity are brought here as a refuge from cruelty and mismanagement. 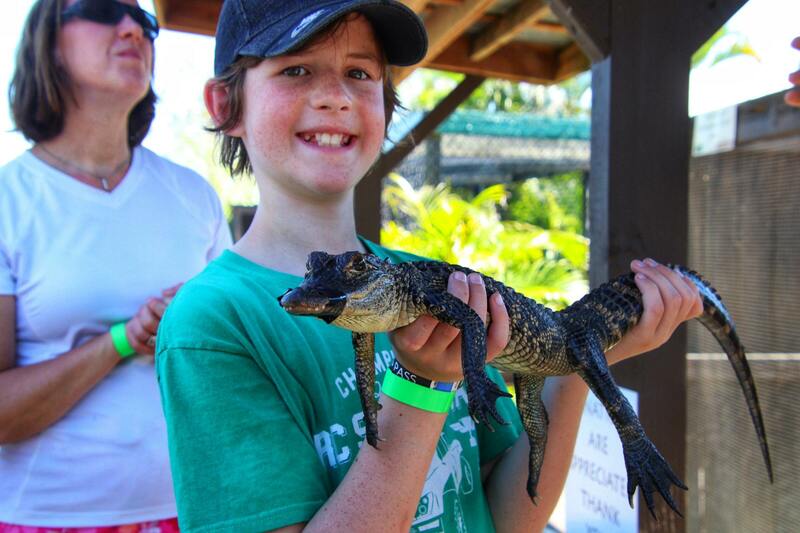 A walk around brings us close to some younger alligators, one of which we were even able to hold! It’s easy to understand why alligators have been hunted for their skin. Their underbellies are surprisingly soft. I imagined a tough skin, but an alligator’s is soft just like my own. We all got to hold it, though my daughter took a fair bit of convincing. The Everglades are unlike any place I have experienced before. They stretch for miles and miles here in southern Florida. It’s easy to see how they are the largest tropical wilderness in the United States and the largest wilderness of any kind east of the Mississippi River. Though our experience was short, it will remain etched in our minds for many years.